I have many duties and perhaps my favourite is delivering lectures to approximately 80 third year students who have chosen my taught unit on Documentary Filmmaking. Everybody who takes the unit has had some experience in making media. Some have produced short news pieces, and some have been involved in live TV programme delivery, but documentary is such a different animal that I think it essential students get the opportunity to create stories in a completely different way. Documentary methods vary greatly, which in itself is very difficult to get to grips with, and the medium also offers the ability to find a different story within the rushes, something that is both scary and exciting at the same time. This year has seen some very good work produced, but there is one film made on the Mary Rose that really does deserve to be singled out and mentioned for a number of reasons, one of them being that for a good while it was top secret, with nobody from the university able to talk about it due to a non-disclosure agreement. Before the story of this documentary can be told it is essential to list some important historical plot points. 2016 - Three University of Portsmouth students secure the opportunity to film and record behind the scenes events that will show some of the planning, tension and drama behind the 'big reveal' of the ship planned for the re-opening of the Mary Rose Museum on July 19th 2016. So, after brutally stripping 500 years down to just 85 words it is time to introduce the students behind the film. Mark Henderson, Jake Ives and Ryan Jenkins are now graduates from the course BSc Television and Broadcasting, and at the start of 2016 they were facing a significant challenge, how an earth can three students make a behind the scenes documentary on an sprawling event with so much history behind it? It is fair to say that the challenge was suitably daunting. Jake Ives articulated the problems they were facing by stating, "We had spent weeks in lectures watching many documentary films with different filmmaking styles, and now our chance had come to begin documenting this final stage of the museums big opening. Truth be told we were pretty anxious at this point because there were so many people involved in the relaunch that it was difficult knowing who to focus on". Mark Henderson, director of the film added further concerns, "We really felt the weight as filmmakers trying to make sense out of all of the history behind the ship sinking, being found, and now this big relaunch of one of the most incredible museums I've ever seen! The first days we steadied our nerves by just recording what looked interesting. 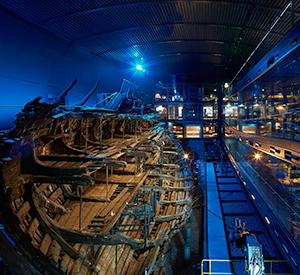 The big element of the story from a documentary point of view was in how the Mary Rose Trust intended to finally present the ship to the world's press and the general public. The ship was in the final stages of being shown for the first time ever without scaffolding and the special chemical spray that had been applied over the years to preserve it. The genius (and top secret!) idea was to project video images of crew members into the ship at different points, and some of our other university students had been invited to collaborate and help the company (Graham English & Co) that had been commissioned to realise this specialist undertaking. So we were pretty overwhelmed with what we had taken on, but then on the second day we realised the story we required was staring us right in the face". Editor of the documentary Ryan Jenkins was the person responsible for telling the story and states, "our lecturers Charlie Watts and Stephen Bellinger kept stating how important it was to keep things simple, and to always do what was right for the story of the documentary first and foremost. So we had to choose some key characters to help shoulder the main narrative, and the most obvious people to help with that were two maritime archaeologists Alex Hildred and Christopher Dobbs. It was difficult singling out just two people from all of the dedicated team that help present and preserve The Mary Rose, but Alex and Christopher personalised all of the passion and hard work involved, and their contribution helped make the story vital for an audience". It must be a very strange experience for students to produce a film that cannot be seen until permission is given. Within education once a film is submitted it is usually viewable quite soon after. These circumstances led to the university inviting the Mary Rose Trust to a special private screening of the newly made documentary. It was a chance to celebrate the collaboration between the museum and the university, and to allow the students a chance to show how good their film had come out to everybody that had helped. It was an unforgettable screening, and as their lecturer and course leader I am really proud of their abilities and the film is a major accomplishment. The students involved had to make on the spot decisions and create the most professional film of their lives, and under enormous pressure they delivered.